“I don’t know what they’re going to charge me with,” said Jerome Corsi in an interview with ABC News on Monday. “I think my only crime was that I support Donald Trump. That's my crime, and now I'm going to go to prison for the rest of my life for cooperating with them,” he later added. Corsi is one of more than a dozen individuals associated with political operative Roger Stone -- a longtime and close ally of President Donald Trump -- who have been contacted by the special counsel. The witnesses, many of whom have appeared before the grand jury impaneled by Mueller’s team, have told ABC News they were asked about Stone’s dealings during the 2016 election and what if any contact he may have had with Wikileaks founder Julian Assange through an intermediary, which Stone denies. 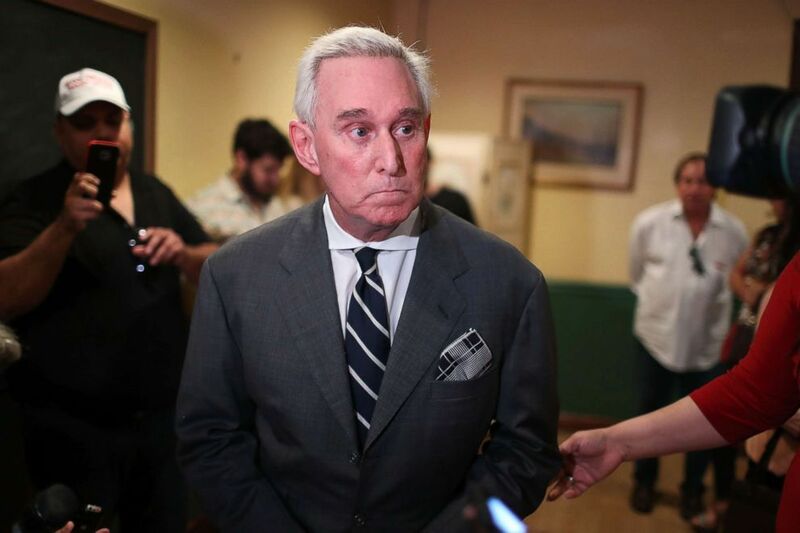 Much remains unknown about Mueller’s interest in Stone. But Corsi has emerged as a central figure of interest to Mueller as he builds his case, sources confirm to ABC News. Corsi, who Stone told ABC News he has known for years, has frequently appeared with Stone on-air for Infowars, where Stone currently serves as a contributor. Roger Stone, a longtime political adviser and friend to President Donald Trump, speaks during a visit to the Women's Republican Club of Miami, May 22, 2017, in Coral Gables, Florida. The special counsel’s office declined to comment on Corsi’s remarks to ABC News. In recent weeks, ABC News reported that Corsi returned to Washington, D.C., again for more closed-door meetings with special counsel investigators, and was scheduled to make a second appearance before the federal grand jury in the probe. However, Corsi’s second grand jury testimony was ultimately canceled, and Corsi says prosecutors with the special counsel’s office told his attorney to expect forthcoming charges. Reached by ABC News on Monday, Corsi's lawyer, David Gray, declined to comment on the matter. Mueller’s interest in Corsi is believed to stem from his alleged early discussions about efforts to unearth then-candidate Hillary Clinton’s emails. The special counsel has evidence that suggests Corsi may have had advance knowledge that the email account of Clinton’s campaign manager, John Podesta, had been hacked and that WikiLeaks had obtained a trove of damning emails from it, two sources with direct knowledge of the matter told ABC News. In response to ABC News’ interview with Corsi, Stone defended Corsi as “a man who has been squeezed hard but refuses to do anything but tell the truth,” and called into question both his and Corsi’s alleged connections to Wikileaks. Corsi said he was first approached in late August by FBI agents at his home in New Jersey, who presented him with a subpoena to testify before Mueller’s grand jury. Corsi added that over the last two months, he’s spent 40 hours with investigators over the course of six meetings, which he says have included special counsel prosecutors and an FBI agent. After the subpoena was served, Corsi said that he decided to cooperate with the special counsel’s office. After the FBI’s visit, Corsi said, he and his attorney agreed to cooperate with the special counsel’s office and proffered to meet with special counsel investigators to answer their questions. “They have everything: Electronic surveillance -- everything electronic probably that I ever did in my life if they wanted -- every credit card, every phone call, every email, and I turned it all over to them as well,” he added. Declining to give specific details on the matter until Corsi learns what he’s potentially charged with, he said the special counsel initially wanted him as a witness and told him he had not committed any crimes. Corsi said that from there, after two months of questioning, things deteriorated between him and investigators. While Corsi is not a widely-recognized figure, his handiwork in the political arena has at times become very well known. He has served as the pioneer of several enduring political smear campaigns during national campaigns throughout the 2000s. Corsi’s most penetrating smear campaign is the same one that helped forge his bond with Trump. He is widely considered one of the early promoters of the so-called “birther” movement, which pursued the idea that former President Barack Obama was born in Kenya, not in America. The theory was debunked and widely denounced as baseless, racist vitriol. Corsi and Trump have long been blasted for not walking back their claims even after Obama produced his long-form birth certificate. In fact, it was only in the final stretch of his successful 2016 presidential bid that Trump finally acknowledged that Obama was born in the U.S.
Corsi has also been cited as one of the architects of a 2004 effort to bring then-Democratic presidential candidate Sen. John Kerry’s war record into question through a 527 political organization called Swift Boat Veterans for Truth. The group attempted to cast doubt on Kerry’s Vietnam War record and question the injuries he sustained when he earned decorations that include a Bronze Star, a Silver Star, and three Purple Hearts. Corsi claims that his work is part of the reason he believes investigators are probing him. When ABC News asked if he would be open to making a plea deal with the special counsel’s office should they charge him in coming days, Corsi replied, “What’s there to be a plea deal with?” and expressed his suspicions about the possible charges investigators may claim against him.